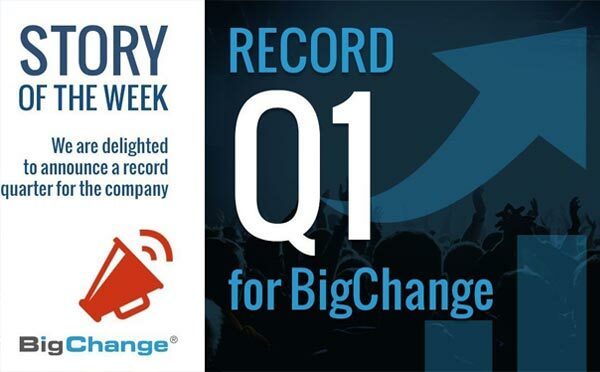 In the first three months of 2018, BigChange secured £4m in new contract wins, beating our previous record of £3m. We have won 50 new customers during the period and also generated significant repeat and renewal orders from our base of 700 customers. We are forecasting £11m turnover for the current financial year, based on our current growth trajectory. We will increase our customer base to 900 companies by the end of 2018. This will take our total number of subscribers to 23,000. BigChange has become a major player in the Transport, Service and Construction industries, as well as the Public Sector. Our customer base currently spans as many as 40 different sectors. On average, we deliver a return on investment of £15 for every pound spent. Our proprietary technology, JobWatch, is used for sales and marketing, customer relationship management, operations (including stock and asset management), contract management and smart scheduling of jobs and appointments. Our powerful back-office app allows customers to streamline their operations and go paperless. We will give our customers the tools to grow and collaborate with other ambitious companies. Through our network, customers will use JobWatch to find partners, work together on projects, extend their geographic reach and outsource jobs. With JobWatch, you can track the appointments, jobs, deliveries and collections in real time, providing true control and transparency. We believe we have created the Uber of job scheduling and service collaboration. Big thanks to all our existing customers, who have supported us over the last five years. At BigChange, we make a point of spending time on the road with our clients’ engineers and drivers, finding their pain points, offering pro-tips, and taking product-insight back to the office. In the last three months, I have held Shop Floor days with a number of customers, which I have delivered invaluable insights. I’m grateful to all involved. Our team have worked tirelessly to support our incredible growth. We now employ over 70 people between the UK and France. We strengthened our leadership team with the appointment of Andrew Scully as Managing Director, Mike Buck as Operations Director, Charlie Bartfield as Sales Director, Alex Epstein as Chief Marketing Officer and Matt Ashworth as Deputy Chief Technology Officer. We also promoted many team members and introduced lots of new talent to the company. All our employees are BS7858-certified. We are excited about opening our offices in Ireland and the United States. We’ll share more on these exciting developments as they happen. Our Lab Development Team has been hard at work developing new features, such as Collaboration, where two separate companies can work together to fulfil jobs. The tool enables companies to divide the task of booking and scheduling jobs, health and safety, and workflow management, all under their own bespoke templates. We also launched our new on-demand booking app and built new solutions for sales automation and consignment tracking. Our team has been working hard on achieving ISO 9001 and ISO 27001 including General Data Protection Regulation (GDPR) developing all the features in readiness for this important new legislation. Our first workshop for the Plumbing and Heating Industry was a great success, and we will announce further dates for the other industry sectors that we work with. We won the Northern Star Award 2018 sponsored by GP Bullhound and Tech North. We were chosen by Tech City UK to feature in the Future Fast 50 technology companies to watch. We were also racked the 11th fastest growing Tech Company in the North and Scotland. We look forward to seeing you at the following expos during the next three months: Commercial Vehicle Show 2018 24th to 26th April, NEC Birmingham. Field Service Management Expo 2018 19th to 21st June, London Excel & Housing 2018 26th to 28th June, Manchester Central. We have two pairs of tickets available to watch Nic Hamilton (brother of Lewis) race this weekend at Brands Hatch in rounds 1 and 2 of the Renault Clio Cup. If you would like to attend, please email your details to info@bigchangeapps.com now! We have tickets for the whole race season, and we’ll be in touch soon with information on how you can apply for tickets for the other rounds. So far this year, we have welcomed Toyah Wilcox, Holocaust Survivor Arek Hersh, Children’s Charity The Kirsty Club and our Brand Ambassador Nicolas Hamilton. This month we have lined up Fabrice Muamba former Bolton and England player to speak about his past and how he dealt with his BigChange after his heart stopped beating for 78 minutes during a football match at Tottenham Hotspurs. We are proud to have expanded the network of charities supported by BigChange. We now donate to more than 10 organisations. We also are Corporate Members of Business In The Community, Brake and Transaid. I have personally visited Zambia with Transaid and saw for myself the incredible work done on the ground fighting malaria in Serenje with Mothers and Children and the Driver Training School in Lusaka. Article précédentCEO’s Blog – BigChange signs £4m connectivity deal with Wireless Logic GroupArticle suivantCEO’s Blog – There’s a lot of nonsense out there about what it takes to be an entrepreneur and build a thriving business.